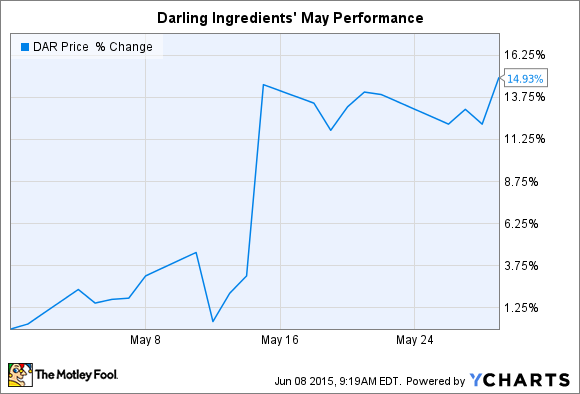 What: Natural ingredients producer Darling Ingredients (NYSE:DAR) saw its stock rise by 15% during the month of May, according to S&P Capital IQ data. That pop pushed shares off of the 52-week low of $13.60 per share set in the days leading up to the company's first-quarter earnings release. The stock is currently down 15% this year. So what: Darling's first-quarter report, posted on May 14, wasn't as bad as some investors expected. Yes, sales shrank by $72 million, or 8%, but that dip was driven by lower raw material prices and a stronger dollar, relative to other currencies. The company's sales volumes, on the other hand, rose in its food and feed divisions while slipping slightly in its fuel business. Now what: With the price environment looking to remain tough this year, Wall Street analysts expect Darling Ingredients to book another hefty sales dip in the current quarter. In fact, revenue should sink by 10% to $918 million. And earnings are forecast to drop at an even quicker pace, down to $0.09 per share from last year's $0.24-per-share haul.